Find out what SuperFastBusiness listeners think and what they want to know. 20:46 – When do you stop building your business? James Schramko here and this podcast episode is the first of a kind actually. This is listener call-ins from the application that I’ve got installed on most of my websites which is called SpeakPipe and it enables people to leave messages. Now some of the messages I got I guess I could have expected, some of them I would never have imagined in a million years. Listen in to find out what was so interesting when I went through my SpeakPipe messages. James: Well Jim, as you can see, it works just fine. Thanks for stopping by. Listener: “Hi James, this is Tim from Canada with a quick question on password protection. I’m the tech guy behind melissawest.com’s website and membership site. And first may I just say a special thank you. Melissa’s business has absolutely exploded since following and learning from your various products and online teachings. She was recently voted number one yoga teacher in Canada. Her online membership is growing and we’re taking the show on the road for a few weeks. This is inspiration from your recent trip to Europe. James: Hey Tim, thank you for that it’s great to hear that Melissa’s going so well and that you’re really implementing the stuff we talk about. In terms of team password protection, we’ve tried both Passpack and LastPass and by far in a way the most reliable and easiest to use was Lastpass. We did have problems with the other one. So LastPass is my recommendation for the team. When it comes down to individual use, I’m still using one password and I’m on Mac. And another good solution for individual users on PC is Roboform. It certainly makes moving around the websites much, much easier because the last thing want to do is have to try and remember all those passwords or put them into some kind of spreadsheet. I hope that helps. Thank you for leaving your comment Tim. James: Thank you Kaye; it certainly is the right thing. Have less things. Things become so much easier with that sort of focus. I’m sure you’ll have a great year. Listener: “Okay. Hi James, My name is Valkyria. I’m not really good at recording but I just feel to say that I have been following your course on Facebook and seeing how much reaction you’ve been having, definitely it’s because you are making a difference in people’s lives. Not only through the amazing content and support that you deliver to many and but also because you are yourself. You are real, you are the real deal. James: Well I just want to say thank you so much for your positive comments. And I know I do react sometimes to the comments that people make and I also understand that you can’t have people who love your content without the odd person that thinks you could improve. And I also know that sometimes when people say things, myself included, that we’re really just expressing something that we feel about ourselves. So your words of encouragement are very heartwarming as are the many comments and emails that I get. And I think that the reason I keep listening to them all, I guess observing them, is because sometimes they’re actually right. Look, I know I have really got a lot to learn with audio quality, and lighting, and film and, maybe I should shave more, maybe I could adjust my wardrobe a bit. I guess the main thing is that I’m just out there doing this stuff and it might not be perfect, it might not suit everyone but I’m doing it and I encourage others. Step out there and do something. Come and post your comments about what you’ve done as a result of seeing me get out there with a low bar so that everyone else can safely proceed. So I really appreciate these comments that are very heartwarming, thank you. James: TJ, thanks for posting that. I know someone listening to that might think that is an extraordinary claim but you are an extraordinary person because you did something that not many people do. You got a hold of me, you asked me specifically what it is that you could do to get better results and I told you exactly what worked for me. And the thing that you did that’s different to many is you implemented. You took a proven formula, you executed perfectly and it’s no wonder that you’ve had such an outstanding increase in your income. It’s because you applied a known and proven strategy, so thanks for posting that TJ, that’s really encouraging and I know you’re just at the start. You’re at the foothills of an extraordinary career so this is just exciting for you and for me and should be inspiring to listeners. James: Well, thank you Peter. And just because you clicked on that button, you now get to be listened to by approximately 3 to 4,000 listeners so now you’re famous. Thank you so much for leaving that comment. That’s very nice. James: Hey Mike, thanks for leaving that message. Be sure to spell my name correctly. If you’re going to put the ink on that back side, make sure that it’s the right spelling. I want to say thanks to you too Mike, because you definitely have been an inspiration in my journey. You taught me many things for the first time, such as unique landing page for each traffic source, you showed me CPA marketing and CPV bidding. The presentation you gave at Underground 4 was one of the most phenomenal presentations I’ve ever seen for content. I mean, I came out of there with a phonebook and promptly quit my job, so I owe a lot to you. You showed me the iPhone, you showed me the Facebook app on there – the touch to tag a name, way back before anyone else was. You told me about Kindles and you’ve got one of the best Facebook groups on the planet, the “Internet Marketing Super Friends”. Plus, your course CPA Tsunami is still occupying space in my cupboard and I’ve pretty much thrown the rest out. So, thank you Mike Hill, you are a legend sir. James: Thank you Steve, I really appreciate that. It’s nice to know that someone’s actually listening to this website. When you first start out publishing, it’s kind of like you’re doing it in a vacuum. And then at some point, someone contacts and they make a comment. And for this technology to be able to leave a voice message, I really think that’s the next level of connectivity where you get to hear the personality behind the comment and it’s great. Now listeners, if you want to be on the show, just go to SuperFastBusiness.com. Have a look down the side, you’ll see the option there to leave a voice message and remember that anything you put there I may publish, so just make sure you’re happy for that to go up there. I won’t reveal all your details unless you say your name. I do see the name and the email address but of course I won’t publish that. Listener: “Hey James, my name is Stephan and first I just want to say that I really like your style and like what your teaching. I listen to your SuperFastBusiness videos or actually on the podcast mostly and I’ve also been seeing your posts pages time to time. And so now is a really great job and I have questions about some shows ago you talked about that you use a VA from the Philippines for among other things doing the transcripts from your videos or mp3’s. James: Stephan, you’ve raised some great points there. Firstly, if you want to learn exactly my process for this mp3 and video publishing, I’ve published OwnTheRacecourse for FREE on SuperFastBusiness.com you can also pick it up in iTunes and listen to the whole thing and it’s on YouTube. But if you go to OwnTheRacecourse.com, you’ll get sent an email from me the following day with a link to every one of the modules. Now I love the Philippines because people are so nice and they speak fantastic English. But if you’re just doing transcriptions, check out a service called Fox Transcribe, you’ll pay about a dollar per minute with a 48 hour turnaround and they’re very accurate. Now I do a lot of content. I mean I’m putting out probably 2 pieces of premium content per day so I have fulltime staff to do these things. But if you’re just doing a little bit here and there, then get a service where you’re paying per transcribed minute. That might end up being a little bit more cost-effective for you. James: Hey Ian, welcome to Australia. The snakes and the spiders they’re not as bad as everyone says, okay, so you will have a great time. Now if you need income in a hurry, then this might surprise you but I suggest that you actually seek employment. There’s plenty of media agencies and corporate gigs for people with these sort of skills. I think the fact that you are from the USA might play to your favor because it’s still considered that there’s a leading edge over there in the USA for this internet stuff. There’s a little bit of a time lag for corporate Australia between the stuff that’s over there and over here. Now that being said, as soon as possible, I would say build up your own business. Whether you start out as an affiliate marketer or a authority blogger who creates products and workshops and services, perhaps you can become a provider of media services like SEO and websites like a lot of people do with my own products and services, that would be a good start. You can find out about that on SuperFastBusiness.com/services. There’s pretty much a menu of all the things you can supply. Your job is to go out and find customers. Whether you go to business meetings or networking functions, and find people who need a website and I’m sure you’ve already dealt with people. You may have had a removalist or furniture mover help you move things when you set up your place. Perhaps you’ve dealt with local trades people to install a satellite TV or whatever. You’re probably in contact with the type of people who would need a new website and an SEO package. So that is a great start, and certainly scalable up to seven figures plus, and I know several of our service providers are making mid six figures, and some of them are doing a little better than that. So that’s where I would go as quickly as possible. In essence I would recreate the kind of business that I have actually created and then I would work that through to a mature phase. Have a great time in Australia, but remember that from Australia you can see all the markets in the world, and for that reason I’ve got customers nearby, like New Zealand, and then all the way over there in North America and Canada and the UK, and it’s great that we can deal with any other country. Anyway, I hope you have a great time and hopefully some of those things help you. James: The technique Mark was talking about there is The One Thing. That is just focusing on that one thing that is going to get you the results that you need, even if it takes the next few days or the next week, because if you did one thing per week, that’d be fifty things a year allowing for Christmas and perhaps a birthday or something. Mark, thanks for your comments, and my goodness, haven’t you got the most amazing radio voice? Seriously, that is solid. I love that you took the time out to make a comment, and absolutely, when you pop down to Australia, please let me know, and I’m sure we’ll be able to find a coffee shop that will blow your mind after that Starbucks stuff they spoon onto you over there. Thanks so much for calling. James: Oh, sorry Bart, is that the time? Look, I’m going to have to cut you off just there, thank you very much but really, I’m not even the slightest, remotely interested in multi-level marketing, so thanks so much for the call, I’m sure it will be wonderful, and if it does indeed become more successful than Google, as you suggested on the call, then you will be absolutely doing splendidly. So thanks so much for calling, and it’s time for the next listener call. James: Hey Caroline, thanks for leaving a message. I’m glad you’re getting into conversion optimization. I’d love to know what results you got for your video thumbnail test. And I’m glad you did click on the Leave A Message thing. 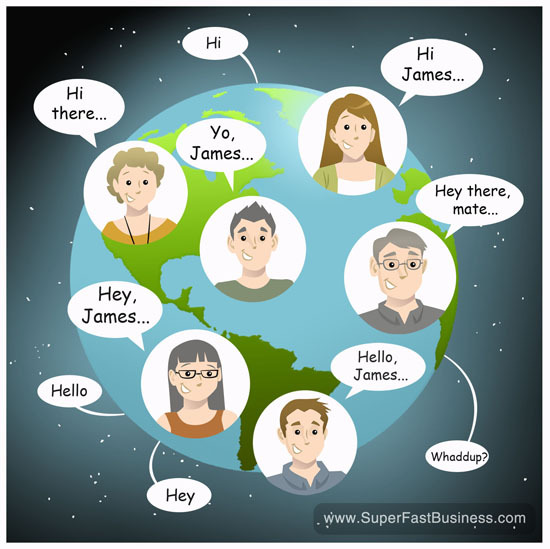 It was lovely to hear your voice and from another country, all around the world here from SuperFastBusiness.com. And by the way, because you like trying out new things, did you know that it’s impossible to lick your elbow with your tongue? Give it a shot. James: Hey, Trisha, absolutely it works. Thanks so much for leaving a message. Thanks for the tip of Fox Transcribe. I used them the other day, and it worked out really great. They have now changed name to rev.com, but work as good. Thanks Stefan, I did not know they changed – what a cool domain! Glad it worked out.